Let me be honest with you. I have crushes. 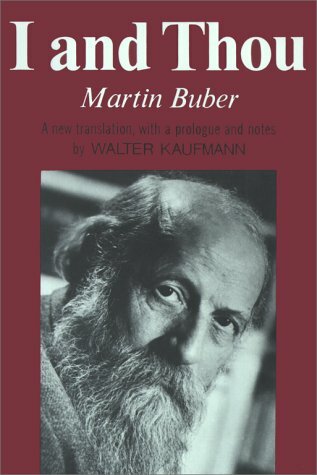 My latest crush is on a Jewish philosopher/theologian named Martin Buber. I heart Martin Buber. For my most recent module we were required to read two books by Buber, I and Thou and Good and Evil. I’d probably heard of Buber before that but I’d never read Buber before that. I read I and Thou first and my initial reaction was, “Martin Buber, where have you been all my life?” Buber speaks my language, or I speak his, and this little book gave me a grid for understanding myself and my little world a whole lot better. Ultimately the book gave me some truth that empowered me to relate to other people in a whole new and much healthier way than ever before. In I and Thou, Martin Buber describes the nature of man’s relationship to the world around him. He says that we experience or encounter the world as “I/It” or as “I/Thou”. The world around us is bent towards experiences where we collect data, make observations and evaluations based on senses and understanding that always keep the other at some distance, “I/It”. Buber calls us to the second way, the way of encounter wherein we discover the depth of “I” through relationship to the “Thou” that is transcendent in everything around us (even your cat). In this level of relationship we actually discover the fullness of our own identity as it is reflected by our connection to the Thou we encounter in people, places and things around us. Buber makes this observation, “We say, “far away”; the Zulu has a sentence-word instead that means: “where one cries, ‘mother, I am lost.’ ” And the Fuegian surpasses our analytical wisdom with a sentence-word of seven syllables that literally means: “they look at each other, each waiting for the other to offer to do that which both desire but neither wishes to do.” This passage made me think of a visit to the Grand Canyon and trying to capture what I saw through there by taking a photograph. Looking at the image later, it wasn’t even close to capturing the actual encounter with the Grand Canyon when I looked into the abyss and found the abyss is looking back into me. This is not mere semantics but something real that is common to human beings. Our encounters are much bigger than our language makes room to communicate and we need to live with an awareness of this moment and everything that is happening in it rather than reduce it to something hollow, just a snap shot of the real thing. This “reduction” is what experience leads us to. We fit our nouns (people, places and things) into neat categories and labels and then pin them forever onto boards under glass like a collection of dead flowers or insects. Encounter takes this moment and allows our nouns to be what they will be as we discover who we are (I) in response to their being (Thou). It is confrontation that uncovers who we really are beyond the pale illusions of who we think we are or we think we would like to be. “No thing is a component of experience or reveals itself except through the reciprocal force of confrontation.” We all require the other to fully become who we are. Even our “enemies” help reveal who we are by the way we respond to our confrontation with them. We are like a point on a map that is meaningless unless we understand where it falls on the map in relationship to other points. We should value each other, even our “enemies” because without them we will not become our true self. In regard to community, and all these other points of relationship, Buber writes, “True community does not come into being because people have feelings for each other (though that is required, too), but rather on two accounts: all of them have to stand in a living, reciprocal relationship to a single living center, and they have to stand in a living, reciprocal relationship to one another.” This is the “centred set” and we are all moving towards the centre, Jesus, or away from the centre but it is exactly our relationship to the centre and to those around us who are also either moving closer or further, that defines us. Buber, intentionally or unintentionally, describes the nature of living the crucified life in I and Thou. This is a book that I will return to again and again as it has already given me a new framework for many thoughts and feelings that have grown in me through study and experience but needed a structure to make the connections. The practice of I and Thou creates an attitude that removes “enemies” from our world and challenges us to do the hard work of pursuing encounters rather than collecting experiences. I’m enjoying a new way of living that requires nothing from other people and how they behave or perform in my little play in which I star. I’m learning to encounter, to improvise, to discover who I really am as the positive tension of relationship brings me into focus. I’ve got a lot to learn but this I know: Jewish philosophers are hot.